I love making these wicked little lettuce boats. 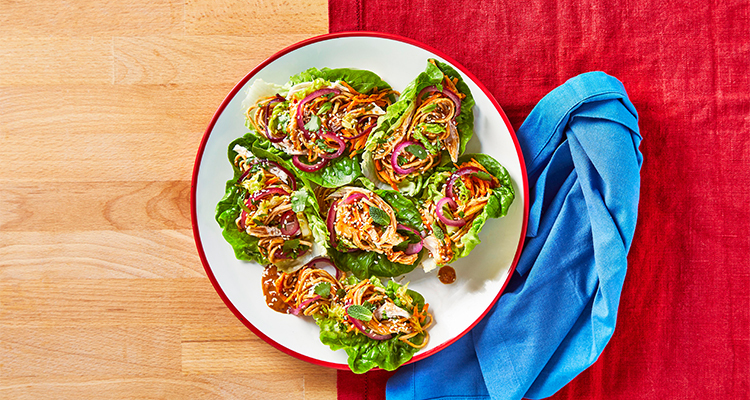 You’ll pack the crunchy leaves with nutty veg, lean shredded chicken and mint, then mix them up with noodles. Great for sharing, everyone will go nuts for these! Add the wholewheat noodles to a pot and cover with boiled water until fully submerged Bring to the boil over a high heat and cook for 5-7 min until tender with a slight bite, then drain and return them to the pot until serving. Meanwhile, peel and finely slice the red onion. Heat a large, wide-based pan (preferably non-stick with a matching lid) with 1 tbsp vegetable oil over a medium heat. Once hot, add the sliced red onion and a pinch of salt and cook for 2-3 min or until starting to soften. Meanwhile, separate 12 outer little gem lettuce leaves, wash and dry them well and shred the inner core finely. Chop the coriander finely, including the stalks. Strip the mint leaves from their stems and chop them finely Grate the carrot and chop the lime in half. Cut half the lime into wedges. Meanwhile, combine the peanut butter, chilli jam, 1 tsp sugar and 3 tbsp boiled water in a small bowl Add the soy sauce and the juice of 1/2 lime and give everything a good mix up – this is your satay sauce. One done, transfer the chicken to a clean board and shred it apart, using two forks – this technique is known as ‘pulling’ Add the shredded chicken, cooked red onion, grated carrot, shredded little gem, mint, coriander and satay sauce to the pan with the noodles Give everything a good mix up – this is your chicken satay noodle filling. Divide the chicken satay noodle filling between the little gem leaves. Garnish with the toasted sesame seeds Enjoy! Recipe from Joe Wicks, visit Gousto to order recipes.